You are here: Home / Giveaways / 1 Sure Fire Way to Beat “I’m Bored” with Your Energetic Kids! Running. Screaming. Laughing. Chasing. Breaking things. Energy. Energy. Energy. This is what daily life is like at our house. I have three kids, 5 and under, and they are FULL of energy. I often think if I could channel that energy and siphon it to myself, I could do the work of 37 normal mothers. But there is no way to siphon it, so I just have to concentrate on channeling it so that there is a lot more laughing and a lot less breaking things. I feel like our home is filled with STUFF. We between birthdays, Christmas, grandparents, aunts, uncles, and occasional just because gifts x 3 the amount of toys and activities in our home is getting to be overwhelming. Not only that, but somehow with all this stuff the kids still end up “bored” and taking their energy out by fighting and getting into trouble. One of my goals for 2015 was to bring less stuff into our home and really be purposeful on only getting (or keeping) things that really engage the kids and keep them entertained. If it also gets their energy out it is a super bonus because nice long naps are never overrated! I got to put this into practice right away as my son had his 5th birthday shortly after the beginning of the year. I thought long and hard, fighting the urge to buy every toy I knew he would love and in the end, we decided on an experience gift and did the Tournament of Kings Medieval Dinner & Show. I was nervous about not having all the packages and things to celebrate his birthday, but he LOVED the show and we made such a fun memory as a family. As my daughter approached her third birthday I have been going through the same process. It is much harder to come up with gift ideas when you challenge yourself to be purposeful in getting something that will be more often used than forgotten. After going back and forth…a lot, we ended up having an idea and hit the jackpot! Since our kids energy seems to be endless, we needed something to engage it. Something without pieces to be lost and something that had the ability to entertain them for days and weeks without getting old. When we thought about what our kids get excited about and what wears them out more than anything else we came up with two things. 1. Swimming and 2. Bounce houses. Since putting in a pool isn’t in the cards, and the bath tub just doesn’t seem to have the same appeal, we decided to look into getting a bounce house. That is when we hit the jackpot! 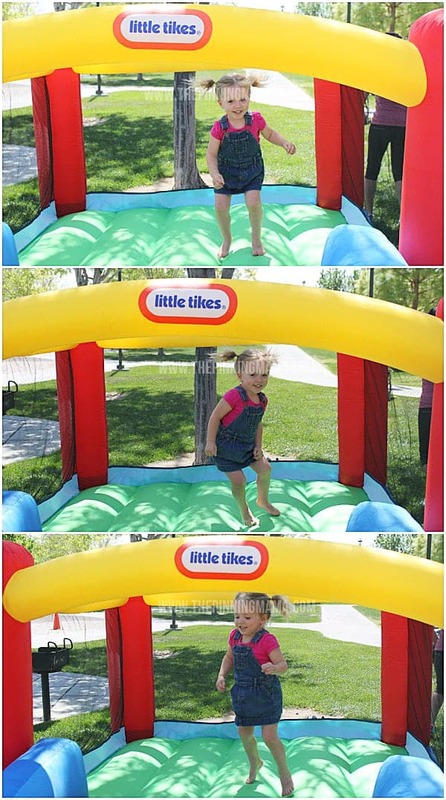 Little Tikes carries “personal” sized bounce houses, like this Little Tikes Jr Jump ‘N Slide Inflatable Bouncer, that are PERFECT for ages 3-8. 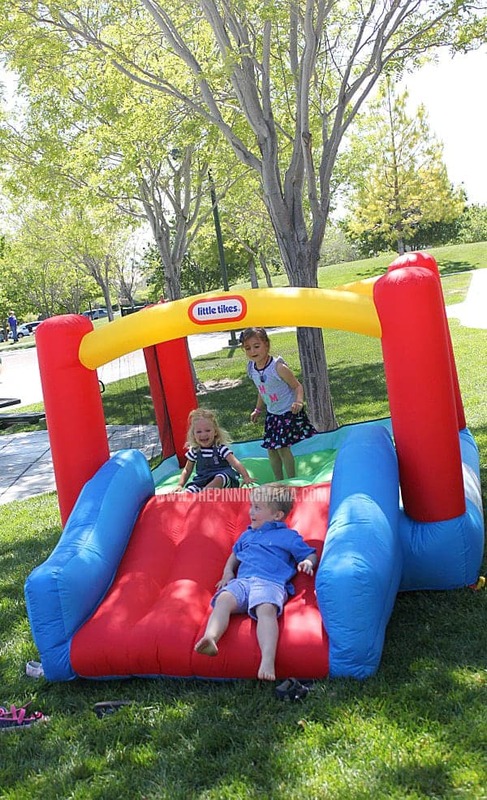 Not only are they easily blown up to provide hours of fun, but they also come down in minutes and fold up really compactly into a nice little bag so they don’t have to become a permanent fixture of your yard, and can go with you to become the life of any birthday party or get together. We absolutely thought so. You can pick them up at Toys R Us and check here to see your price. We found that buying this one bigger gift was about comparable to picking up all of the toys and junk we normally accumulate and as a bonus, we were able to use it as entertainment at her birthday party for far less than it would have cost to rent one! But does it get old fast? This was our biggest fear, and turned out to be the absolute best part. When we decided to go with the bounce house as one big gift, we hoped it wouldn’t be something novel used for 10 minutes and then forgotten forever more. What we found is that it is my kid’s cure to bordom! We have had our Little Tikes Jr Jump ‘N Slide Inflatable Bouncer for about a month and not only were they ecstatic when we got it and bounced until we made them stop to eat, bathe and sleep, but they have asked to bounce every day since with the only exception being when we were out of town. My 3 year old loved the gift, and my 5 year old thinks he is the luckiest kid around since he gets to enjoy the gift just as much as she does! When their friends come over they want to bounce. When the baby sitter comes they want to show off their “tricks!” When I am trying to get dinner done, I send them out to get out their energy before we all sit down to dinner. They are using their imaginations to make up new ways to entertain themselves though pretend play and new fun games and tricks every day. They love to pretend, play, bounce and race each other down the slide that is wide enough for them to slide side by side! And all this bouncing makes for some really solid nights of sleep! It really doesn’t get better than that! I am sure at some point we will pack it up, but so far we just turn the motor off let it deflate and then turn the motor back on and it airs up in seconds ready for more bouncing fun. This was a lifesaver for mom, and couldn’t have been a more perfect gift for my three year old! 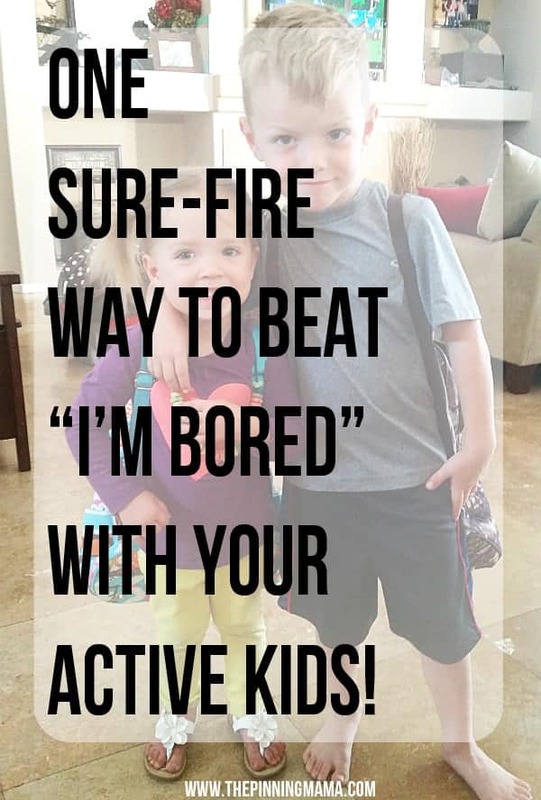 If you have active kids that “get bored” and start to get into trouble, it will be as much of the perfect gift for you as it is for them! To see more Little Tikes fun you can visit their website and follow them on Facebook or Instagram. If this sounds like a dream, enter below for a $50 American Express Gift Card to put toward your own bouncer or anything else you can dream up! Just enter through the rafflecopter widget below! We have a Little Tykes climb and slide on our porch, as well as a water table, and I love to send the girls out there to play while I work on dinner! I had no idea there was a personal size bounce house. I can imagine that this would be a huge hit, and the kids can go hop in even after dinner to get rid of their extra energy, with no more clean up required! Isn’t it fun! My kids have been obsessed for over a month now! We love family hikes to stay active! My favorite way to keep my grandsons active outdoors is to do different activities with them like blow bubbles, let them run thru the sprinklers, ride bikes, etc. We love keeping our kids active by going to playgrounds. We like to go to the neighborhood park or ride scooters to keep the kids active! My kids would like the Clubhouse Swingset. I Like to take my kids on nature walks. We love going to the park to stay active! The cape cottage play house! My favorite my kids active is to do relay races they always love to do that! We love to go swimming at the beach! We stay active at the park and playground. I take them down to the park to play on the playground or go for a bike ride on the trails. I make sure we get outside at least once a day to play. One thing that keeps the kids active and cooled off in the Summer is on the Slip N’ Slide. We like doing crafts and cooking together! My favorite way to keep kids active is to have something planned to do outdoors every day…going to the pool, the park, the beach, etc., to get them up and out of the house! I love to take long bike rides and walks with my daughter. My husband & myself have always taken our kids in the woods. At the end of July we start ginseng hunting & that gives them a lot of time in the woods & we make good money doing it. We also camp and hike among othet things. But we definitely are an outdoors family. I like to play with them to wear them out. I like having my kids join sports teams at school. My favorite way to keep my kids active is to have my daughters walk our puppy around our cul de sac.